Exploring the gorgeous trails of Sugar Pine. Great groomed trail through the pines. Map of the cross country trails at Sugar Pine Point Park. Taking a lunch break near the bridge on the red trail. 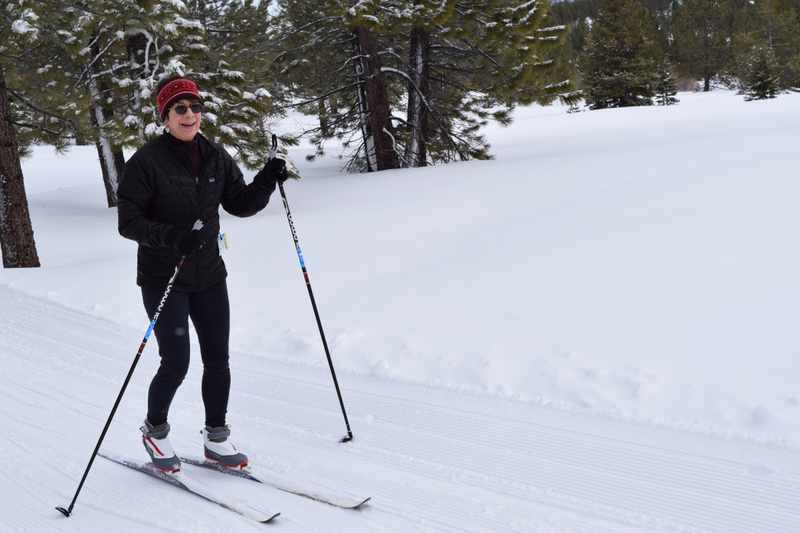 Sugar Pine Point represents total of around 12 miles of cross country skiing, best suited for short, relatively flat loop work outs. Relatively flat, well marked trails. Beginner friendly area to explore. Dogs are not permitted on the trails here; they are restricted to on-leash and in the parking area. Six dollar California State Park vehicle parking fee for the day, annual State Park pass also recognized. 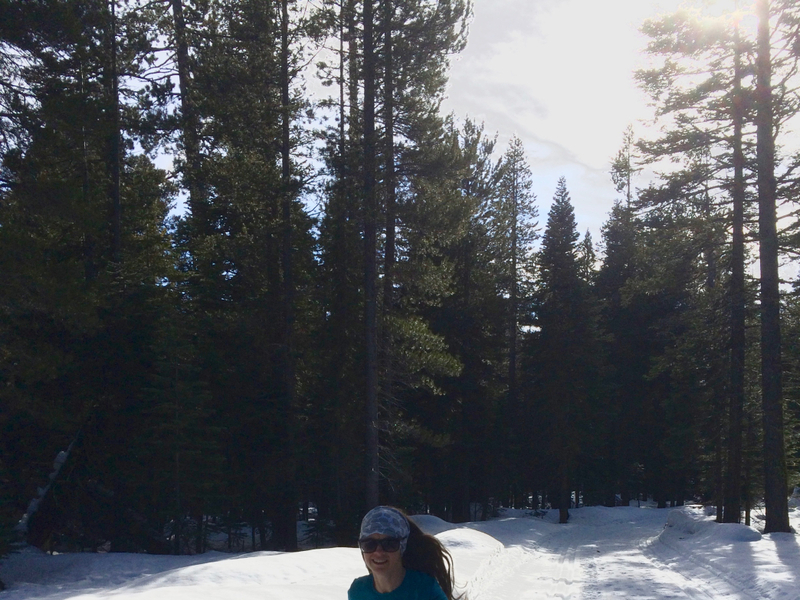 This is a gorgeous and quiet area of cross-country ski trails that feels like a hidden gem nestled in the woods of the west shore of Lake Tahoe. For a quiet, more middle to short distance ski, come to Sugar Pine Point. Expect less pristine grooming in exchange for solitude. 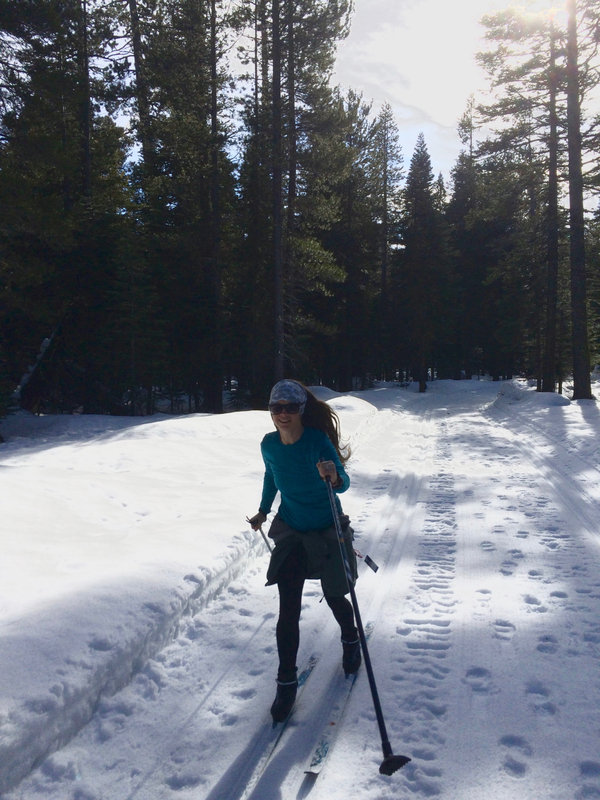 There is grooming and certainly skate skiing on the Sugar Pine trails, but grooming is somewhat more sporadic and weather dependent compared to the larger areas. 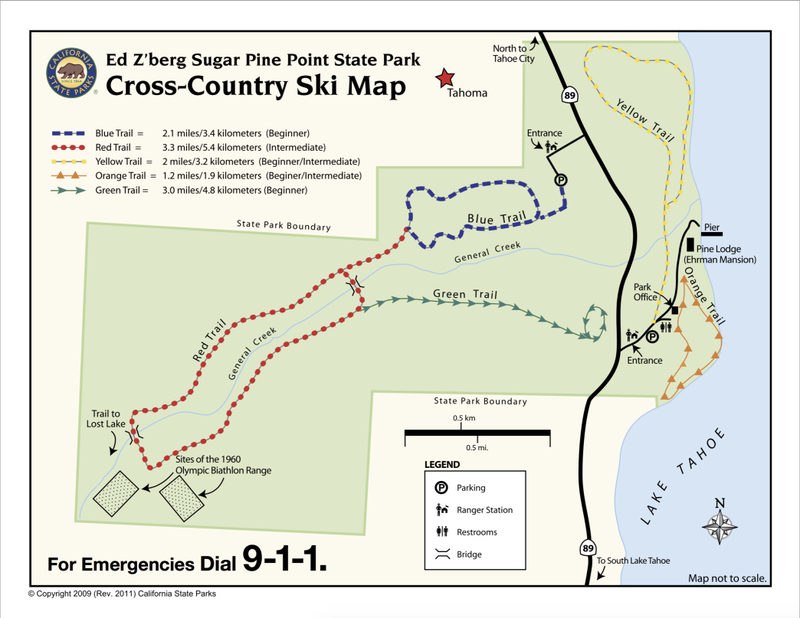 Officially now the Ed Z’berg Sugar Pine Point State Park, it was the location of the men’s biathlon and cross-country ski events for the 1960 Winter Olympics. The trails are scattered with signs interpreting the local Olympic history of the area with pictures from the historic event. The park even puts on ranger led, guided, interpretive programs available through the winter, including full moon snowshoe outings and ski adventures through the park. Find out more by checking the website. Primary locations for cross-country ski enthusiasts in the Tahoe area include the Royal Gorge ski area and Tahoe Donner ski area. Both of these ski areas offer world-class cross country ski trails. Sugar Pine Point is different. Here, you can expect more of a quiet location with less of the skier traffic and tourist bustle. You won’t find a bar or any après, rather here you might be more likely to see a local getting a quick lunch break ski work out. Dogs are not permitted on the trails here, they are restricted to on-leash only in the parking area. Pay only your nominal State Park six-dollar parking fee (and no additional cost per skier) to enjoy this beautiful park in the wintertime. Sugar Pine Point boasts more than twelve miles of cross-country skiing, offering winter exploration throughout the park. There are four cross-country ski trails, two of which are groomed through the winter. Blue and red trails are groomed, and found on the west side of CA-89, near the General Creek Campground entrance station. Each of the groomed trails on this side of the highway is gorgeous, relatively flat, and meanders along through the snow-covered campgrounds, following a small stream. A recently constructed bridge crosses the stream on the return of the loop towards the parking lot. The blue trail distance is 2.1 miles, while the red trail is a 3.3-mile loop. There is also an out-and-back trail, the green trail, that extends off the red trail adding 3.0 miles. On the lakeside of CA-89 and Sugar Pine Point you will find the yellow and orange trails. Access this area from the Ehrman Mansion or lakeside/west entrance to the park. These trails are short loops along the lake with amazing views. The trails from the Ehrman Mansion entrance are groomed less consistently so check them out before showing up expecting to get your skate on. Look for the two main entrances to Sugar Pine Point State Park off of CA-89 and park at one of the two plowed lots. Make sure to pay the six-dollar per vehicle fee to park and use the area State Park, annual State Park passes apply as well. No dogs are allowed on the trails here; dogs are permitted in the parking area on a leash less than 6 feet in length. Sugar Pine Point can offer a much more affordable experience when you consider the cost per skier rates at some of the other local cross-country ski areas. This hidden gem should be on the radar of anyone looking for a gorgeous quiet day in the woods of Lake Tahoe.